Their initial flight out of Florida was cancelled due to bad weather in Jacksonville. They lost their connecting flight out of Florida and had to leave a day later. None of their 16 bags arrived in Luanda, and only two of them did before the team left Angola a week later. It wasn’t enough that the team had a hard time traveling in the air, because the car broke down a couple of times on the way from Luanda to Quéssua making the voyage in ground level hard too. These were just a few of the unforeseen circumstances the third team to visit Quéssua had to face. And yet, this group of eight young adult Christians from ACCESS 218 in Jacksonville managed to overcome all frustrations and responded like giants in the faith. Congratulations to Mrs. Kelsey Linduff, team leader, for providing excellent guidance to an everyday-wearing-the-same-clothes team. And kudos to them all! The tasks the team carried out during the week were many. 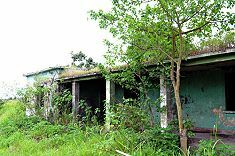 They built blocks for the Boarding House’s dining room; they put mosquito nets on the Transit House’s windows so as to prevent strange bugs that only seem to appear here; and most importantly, they began cleaning the ruins of the old Boarding House, which was damaged during the war. Grass and small bushes were growing on the ceiling and all around these ruins. It took guts, dedication, and a good pair of gloves to undertake this work, because there might be unwanted insects or other dangerous and pretty nasty critters under every piece of debris or plant they had to remove. But now the house is reachable for builders to come, assess damage, and design a plan towards reconstruction. As a matter of fact, we are expecting that team # 4, from Jacksonville, will get their hands dirty working on this beautiful building. Thanks for this groundbreaking work! There was also time for worship, recreation (which contained a lot of silly dancing), and fellowship. An afternoon was spent teaching the boys how to play a fast eye-hand contact card game, which brought many laughs and A LOT of confusion, and made the translators work really “entertaining.” During the evenings they attended worship services held at the Quéssua church, always with Spirit-filled music. Meetings between the youth leaders of the church and the missionary group were also held bringing hope for a long lasting friendship between the United Methodist youth and young adults here and in Florida. 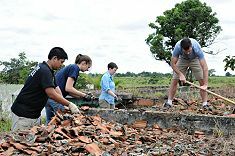 Many dreams have been realized thanks to the missionary vocation of this young adult group. The Rodriguez family thanks you for your effort, endurance, and hard work.